The Piller APOTRANS takes care of critical loads by automatically and transparently providing an alternative power source whenever the preferred power source becomes deficient. This changeover, occurring within a few milliseconds assures that the load is always fed by the optimum power supply. With APOTRANS, redundancy is engineered into the power system infrastructure, giving steadfast confidence in the performance of critical operations. 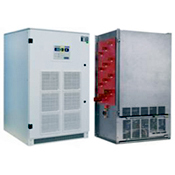 APOTRANS provides optimum power to secure the load for continuous operation. Every time the preferred power source fails or its voltage no longer meets specified quality requirements, APOTRANS intelligently switches to the alternate source. APOTRANS automatically or manually returns the load to the preferred source once it is sensed to be stable.